The following documents are a sample of the correspondence between Lucy Stanton Day (1831-1912), various religious leaders, and the American Missionary Association (AMA). Lucy Stanton Day, a free-born African American woman from Cleveland, Ohio, had graduated from the Oberlin College Ladies' Department in 1850. She later separated from her husband, the prominent African American abolitionist, William Howard Day (1825-1900), also an Oberlin alumnus.1 The letters transcribed in this project focus mainly on the question of her eligibility for a teaching position at a missionary school for freed people in the South during the Civil War. Due to her ambiguous marital status at the time of her application, the AMA questioned her morals and, thus, her qualifications. Reflecting nineteenth-century conceptions of ideal womanhood and the politics of respectability, the notion of female morality was intrinsically linked to Stanton Day's candidacy for the position. Much of Lucy Stanton Day's motivation for seeking a position with the American Missionary Association stemmed from financial necessity. When she married William Howard Day in 1852, he was teaching and writing in Cleveland. In 1856, the couple moved to the Elgin Settlement in Buxton, Canada, a community established as a haven for fugitives escaped from slavery in the United States. In 1859, the year after their daughter Florence was born, William Howard Day traveled to England to raise funds for the Elgin Settlement, leaving his wife the exclusive caretaker of their child. When he returned to North America, he distanced himself from Lucy Stanton Day and their child. Thus, Stanton Day wrote to the Reverend George Whipple, Secretary of the American Missionary Association, explaining her desire for the teaching position, "I am married, though myself and child are entirely dependent on my exertions for support. "2 The estrangement from her husband and resulting financial situation prompted Lucy Stanton Day to write to the AMA in an attempt to secure a missionary teaching job. Unfortunately, her status as a single mother proved a major point of contention for the Association. As one of the first black women to complete a program in higher education, Lucy Stanton Day, exemplified the strong and driven women of the nineteenth century. She performed her empowered womanhood publicly at her Oberlin graduation in 1850. Her commencement speech, A Plea for the Oppressed, targeted American slavery for abolition and, in no bashful terms, directed that plea toward women. She declared, "Woman, I turn to thee. Is it not thy mission to visit the poor? To shed the tear of sympathy? To relieve the wants of the suffering? Where wilt thou find objects more needing sympathy than among the slaves! "4 By addressing women specifically in this matter, Stanton Day endorsed the idea that women, within their proper roles as moral beacons in society, had the power and the duty to enact political and social change. Lucy Stanton Day's life story is, in countless ways, a testament to the many strong, resilient, and radical women that participated in the first wave of American feminism. Her passionate commitment to abolition especially connected her to her radical female predecessors, such as Angelina E. Grimké, who, as early as 1836, linked the abolition of slavery to the Christian duty of women. "Slavery," wrote Grimké, "must be attacked with the whole power of truth and the sword of the spirit. You must take it up on Christian ground; and fight against it with Christian weapons, whilst your feet are shod with the preparation of the gospel of peace. "5 This Christian-driven approach to abolition stood very strongly in line with Lucy Stanton Day's belief in the ability of women's respectability to reform society. In her Plea speech, for example, Stanton alluded to the maintenance of her own respectability as a moral woman, as well as her expectations for other women to work towards change. "Ye that advocate the great principles of Temperance, Peace, and Moral Reform," she declared, "will you not raise your voice in behalf of these stricken ones! "6 In her speech, Stanton did not limit the power of female respectability to the traditional arenas of temperance reform and pacifism, but instead advocated for its expansion into even more political outlets such as abolition. The documents examined in this project center mainly around a discussion of Lucy Stanton Day's respectability, threatened by her estranged relationship with her husband. Despite her history of strong religious commitment and education, as well as her passion for moral reform, the men of the American Missionary Association interpreted her status as a single mother as crossing the line of acceptable feminine behavior. These particular attitudes of the AMA aligned closely with those expressed by Mary Wollstonecraft nearly a century earlier in her 1792 Vindication of the Rights of Woman. Like Wollstonecraft, the AMA valued traditional family roles. While the AMA was in favor of appointing educated women to teaching positions, they were not ready to challenge conservative cultural standards, which dictated that a proper, moral woman was one who was married. In her Vindication, Wollstonecraft argued that women should be "prepared by education to become the companion of man," advocating education for women with the justification that it would better prepare them for marriage.7 The AMA's rejection of Stanton based on her marital status reveals their conservative views based in earlier models of female behavior, and suggests the limitations even in progressive organizations' acceptance of increased female participation. "Lucy Stanton" in Jessie Carnie Smith, editor, Notable Black American Women (Detroit: Gale Research, 1992), 2:588-590. Lucy Stanton to Reverend George Whipple, 26 April 1864, in Papers of Ellen Lawson and Marlene D. Merrill, 30/157, Oberlin College Archives (hereafter O.C.A.) 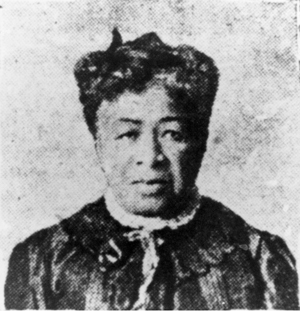 For more information on Lucy Stanton, see "Lucy Stanton (Day Sessions)," in Encyclopedia of Cleveland History, http://ech.case.edu/cgi/article.pl?id=SLA. Lucy Stanton, "A Plea for the Oppressed (1850)," http://www.blackpast.org/?q=1850-lucy-stanton-plea-oppressed. Angelina E. Grimké,. Appeal to the Christian Women of the South (New York: New York Anti-Slavery Socety, 1836). Mary Wollstonecraft, A Vindication of the Rights of Woman (Boston: Peter Edes for Thomas and Andrews, 1792).